Let us give a standing ovation to the bold and stunning man of “Star Wars The Force Awakens”, Harrison Ford aka Han Solo. The legendary series features his ever booming entrance, enough to send chills down the spine. One cannot imagine, how Star Wars The Force Awakens would have been without the character of Han Solo, to say the least.He was first introduced in the Star Wars series back in 1977, as a crime lord, who owes Jabba the Hutt. He and Chewbacca, his co-pilot,opposes the Galactic Empire by getting involved in the Rebel Alliance.Gradually, as the story progresses, Han Solo becomes the leader of the alliance abdsuccededgalactic governments. Must Read - In Love With No-Pants Look? Wear Dresses! Harrison Ford was always a perfect fit for the role and in fact no one could have done it any better than him.Over the years, the character of Han Solo has become more honorable and selfless than before with the looks to die for. 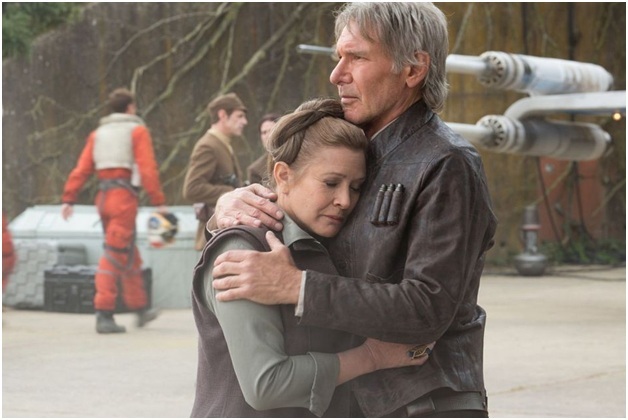 Harrison Ford was able to bring his best performance till date as Han Solo in Star Wars The Force Awakens. Since the Return of the Jedi, the character of Han Solo was reintroduced as a smuggler after 30 long years. Though he and Chewbacca were unable to regain control of the Millenium Falcon from the thieves, yet they are able to get it back once it took of from the planet Jaiku. 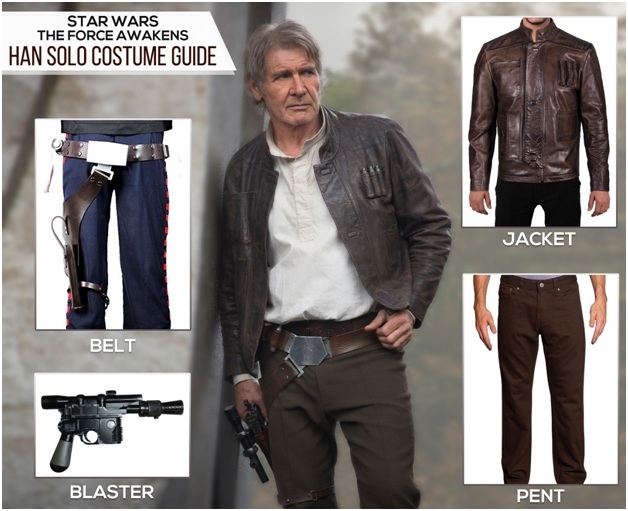 Han Solo Costumes in “Star Wars: The Force Awakens” are a pure fashion statement that you cannot afford to miss out. The all famous attire worn by Harrison Ford in his signature roll, has created a buzz throughout the world. The bold and stunning Han Solo’s outlook is one thing that people cannot get enough of. Before the arrival of “Star Wars: The Force Awakens”, everyone was perplexed whether the character of Han Solo would ever come back, since he was frozen in carbonite in Star Wars: The Empire Strikes Back. 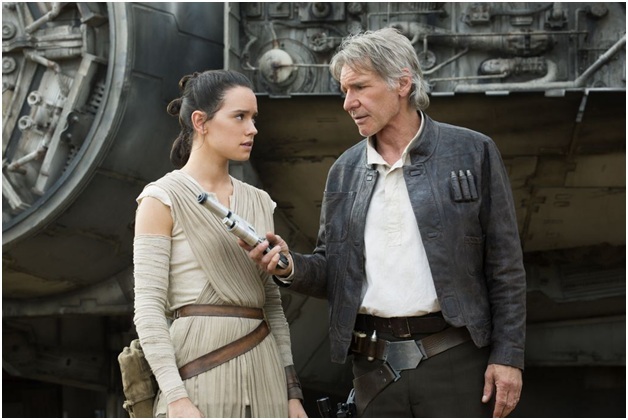 Harrison Ford portraying role of Han Solo is one thing, and his costume further elevates his stature in the classic Star Wars The Force Awakens. Over the years, the character of Han Solo has undergone modifications and transformations. This is why the character has become more dynamic and innovative than ever before. 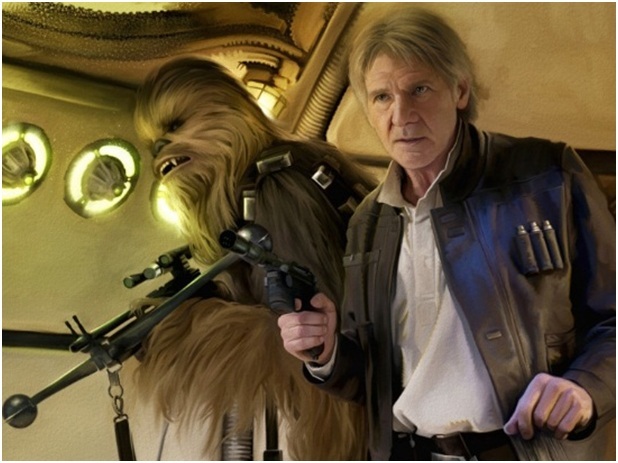 In the latest series, Harrison Ford has displayed his own style statement thanks to the brown jacket with unique metallic buttons andbullet vials on the front. The long sleeves and the detailed stitching with open hem pockets in the branded black and brown shaded jacket, has become attraction to the many. To further enhance the dressing style according to his persona, he garbed brown jeans with a belt attached to dispose the blaster. Everyone is craving to have a look like Harrison Ford and thus black-leatherjacket.comprovides you everything you can ask for.